Richard Yen, senior vice-president, automotive and global markets team, Altair, at the awards. Software company Altair and the US-based Center for Automotive Research (CAR) have announced the winners of the 5th annual Altair Enlighten Award, which promotes innovation in automotive lightweighting. 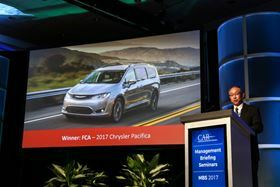 The winner of the Full Vehicle category was the 2017 Chrysler Pacifica, which is 249 pounds (113 kilograms) lighter than its predecessor, while Toyota’s carbon fiber closure panels for the 2017 Prius Prime and Lexus LC500, and Faurecia’s Adaptive Valve for exhaust systems employed on the 2017 Chevrolet Silverado won for the module category. Toyota’s winning entry featured the side and luggage doors of the 2017 Lexus LC and the liftgate of the 2017 Toyota Prius Prime which feature carbon fiber reinforced plastic (CFRP) inner panels, combined with aluminum, glass-fiber reinforced plastic (GFRP) and polypropylene outers for components that are 47% lighter than conventional metal structures. This story is reprinted from material from Altair, with editorial changes made by Materials Today. The views expressed in this article do not necessarily represent those of Elsevier.